Quito is the capital of Ecuador, and at over 2800 metres above sea level, it is also the second highest capital in the world after La Paz. Due to the fact that it is squeezed between two mountains, Quito is extremely thin and long. Getting from the southern part of the city to the northern part can take what seems like forever, cue ridiculous traffic and jam-packed public transport. First things first: we offer a free walking tour of Quito, so if you want to learn about the city’s history, culture and food check it out here. Quito is famous thanks to it’s historic center, which was declared the first ever UNESCO heritage site in 1978. A walk through this part of town will leave you with stunning impressions of architecture from several periods all subsisting next to each other. You will quickly notice that every street has an impressive historic church, and that street food is everywhere. You can try most Ecuadorian delicacies if you walk around for long enough! Towards the south of the historic center is a famous statue of an angel called Panecillo that looks over the north of Quito. Try and visit at sunset, as the views of the city are stunning. You can try a local beverage up here called, canelazo, a strong, fruity hot drink which is great for Quito’s freezing nights! For the best views of Quito, don’t miss out on a trip up the Teleferico, or cable car. Try to go early on a clear day, as you travel so high up that all you will see are clouds if the weather is bad. The teleferico takes you directly to around 4000 meters above sea level, so be mindful of taking plenty of layers as the temperature can drop very quickly. If you’re not used to the altitude yet, take plenty of water and some sugary snacks. Once you step off the teleferico, you can hike to the top of Pichincha volcano, which takes around 4 hours there and back if you are an experienced hiker. If you are less interested in hiking, you can go horseback riding, or simply enjoy the views! As night falls, head to La Floresta, an area north of the historic center, where bars and restaurants abound. Some of Quito’s best eateries can be found in this area, from the priciest to the most budget friendly. For more clubs and dancing, check out the nearby area of La Foch. Most places don’t charge a cover fee, so beware of those in la Plaza Foch which are a bit touristy. We love going salsa dancing at Salsoteca Lavoe on Thursdays, you can find some of Quito’s best salsa dancers here! To experience standing on the line of the Equator, take a trip to the Mitad del Mundo. As well as a monument showing the line of the Equator, there is a museum that talks about the history of the science and indigenous knowledge of the Equator. 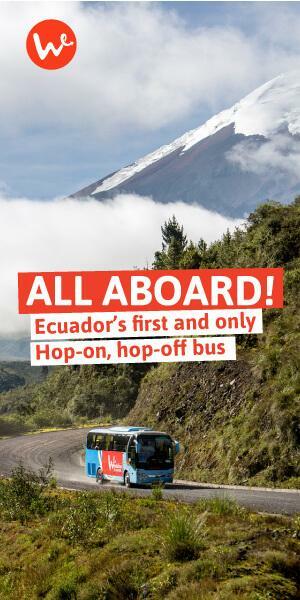 To get here from Quito, travel to Ofelia or Carcelen and get the next bus heading north. If you ask for Mitad del Mundo the operators are very helpful. You can book a tour or a taxi, but this will cost you much more than the bus. If you are planning to go to Mindo after visiting Quito, you can go to Mitad del Mundo on your way there. 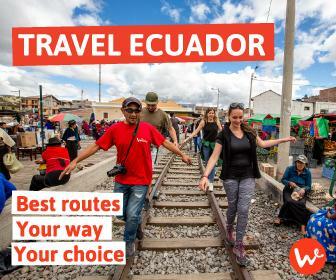 If you are traveling around Ecuador, Quito is a great starting point. Make sure to visit some of the natural beauties around it, such as Cotopaxi, Quilotoa and the adventure-packed Baños de Agua Santa. We actually offer a convenient way to see them all in one day: check out our Jacamar Pass!